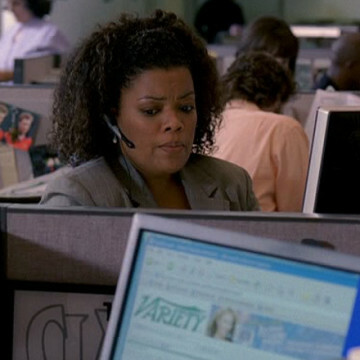 Eric sets out to establish a real business in S04E08 and actress Yvette Nicole Brown plays the part of the Daily Variety agent who takes his ad order over the phone. When Eric informs the agent that he has no documentation outlining his professional relationship with Vincent Chase, Yvette’s character refuses to sell the ad and urges Eric to secure the necessary paperwork. Yvette, who is best known for her role as Shirley Bennett on Community, can be caught near the twelve-minute mark of her Entourage episode.